Divergent is what I’d like to call a ‘nice’ movie. There’s nothing here terrible offensive but at the same time, it doesn’t break new ground either. 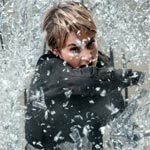 The direction is more than adequate and the performances are good with Shailene Woodley attaining near greatness continuing her winning streak and is clearly the right choice to carry the franchise. But for all the good, the story structure is odd with the bulk of the time relegated to the training with another plotline almost an afterthought taking over the third act.